Acknowledged author Eugene F. Brigham wrote Fundamentals of Financial Management comprising 832 pages back in 2018. Textbook and etextbook are published under ISBN 1337395250 and 9781337395250. Since then Fundamentals of Financial Management textbook received total rating of 4 stars and was available to sell back to BooksRun online for the top buyback price of $85.26 or rent at the marketplace. 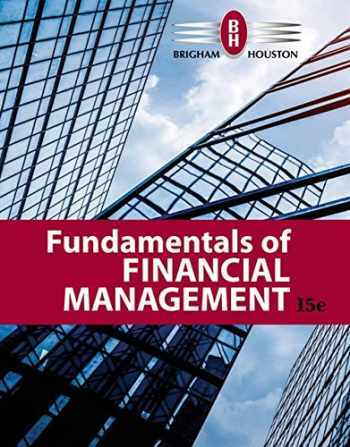 Updated with the latest trends, developments, and practices from the field, Brigham/Houston's FUNDAMENTALS OF FINANCIAL MANAGEMENT, 15e equips you with a thorough understanding of today's corporate finance and financial management. This longtime market leader offers insight into federal debt, the ongoing recovery of financial markets, and other emerging issues straight from today's headlines. Clear explanations and real-world examples help you understand the "what" and the "why" of corporate budgeting, financing, working capital decision making, forecasting, valuation, and Time Value of Money, while hands-on exercises, cases, Excel Spreadsheet Models, and digital resources like MindTap let you put theory into action.